Among the many excellent things about Australia (think: kangaroos, koalas, wombats, emus, kookaburras, the Great Barrier Reef, the Sydney Opera House, the Go-Betweens, shiraz, and footy) is this: it is one of a handful countries where voting by all citizens is compulsory. Well, it's an excellent thing if you're a political junkie (like me), and the result is an Australian political culture that features an astute and engaged electorate. At the moment, Australians are highly attuned to politics, as the country prepares for a federal election before the end of this year. While voters wait for Prime Minister John Howard to call the election, they can stay informed at Google Australia’s election website and on the Australia Votes YouTube channel, which we launched today. The Internet is starting to live up to its potential to deepen political debate and engagement; these tools are a useful example of convergence, as the mechanisms of electoral democracy and political debate move online. Our hope is that they enable Australian voters to learn more about the issues and candidates, to compare and contrast, and to share their own views. 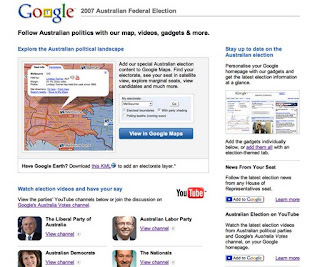 The Australian election website is designed as a central location for Australian federal election video, news, trends, maps, and Google Earth layers. We have created a Picasa Web Album to showcase some of these world-first tools. And just like your Uggs, this product was developed in Australia. Check out all the details at the Google Australia blog. Nice write-up on this in NYTimes. They seem to think that this is your "portal strategy." Anyway, nice thought behind this.